I am, of course, a renaissance man, but I am also that poor soul you see in parking garages scratching his head. I had a particularly distressing experience last week where I searched three floors, then noticed there was an identical parking garage next door. Let’s just say, it was some time before I made it home. So you can imagine my confusion when I went to the Museum of Fine Arts recently to see my favorite painting and couldn’t find it. I wandered all around, repeatedly, without success. Finally I went to the information desk. The staff there were very kind, but also somewhat skeptical: “Are you sure it’s in this museum?” Which is fair enough. They probably have to deal endlessly with guys like me asking for the Mona Lisa or where they parked the car. But the thing was: they could find no record of the painting! They gave me a number to call and I left a message of inquiry. A very nice lady called back with information that was simultaneously saddening and reassuring: the painting was part of a private collection, and the MFA was no longer exhibiting it. Sorry? What is this painting I’m yammering on about not seeing? Jean-Léon Gérôme’s reasonably, if somewhat unimaginatively, titled “The Pigment Seller in North Africa.” I’d show it to you but, alas, can’t find a good enough photo online. But you better believe it’s some fine painting. ** Speaking of getting lost, it’s not just me. 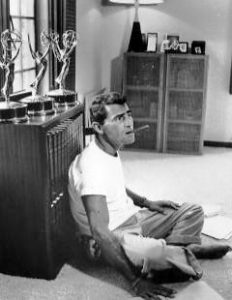 According to his Wikipedia entry, “Serling sometimes went exploring on his own against orders, and got lost.” Now, this was during wartime in the Philippines, but who knows, maybe he had trouble in parking garages too. Also, check out what he did for money during college: “In one instance, he earned $1,000 for testing a jet ejection seat that had killed the previous three testers.” Jeepers! I worked in an office, myself.